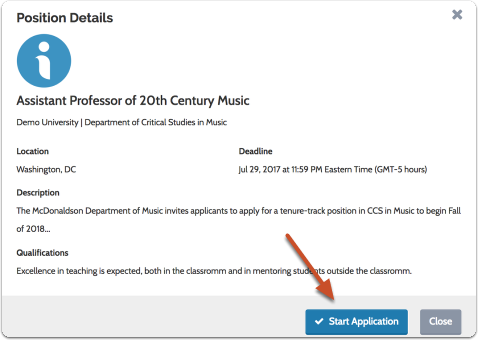 You can request letters of recommendation during the process of applying to an Interfolio-hosted position. The letters you request will be stored in your Dossier account. 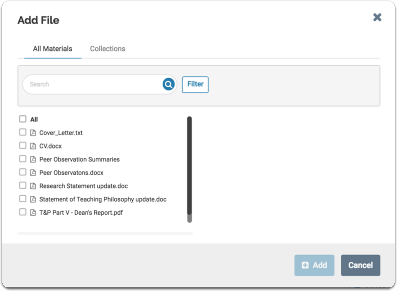 You can also attach letters that are already in your Dossier to your application. If the request is attached to a completed application, than the letter will be forwarded when it's received. 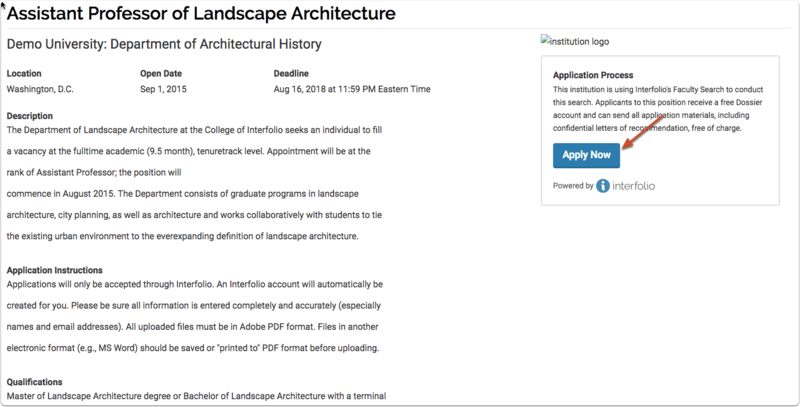 If an institution is using Interfolio to run a search, you will be able to apply online just by clicking the "Apply Now for Free" button in the position announcement. Try searching for position titles, institution names, fields of study etc. 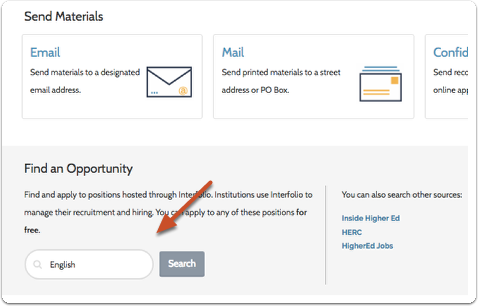 When applying for an opportunity through Interfolio, you are guided through a series of application steps or sections. An overview of the application steps are listed to the right of the screen. 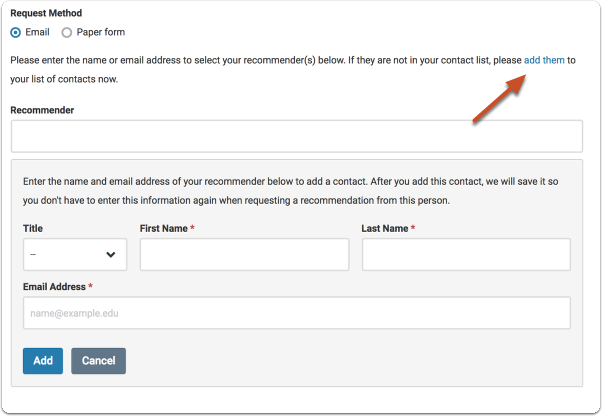 To add existing letters from your Dossier account, select the letters from the list of existing files and click "Add"
If you select a requested letter that has not yet arrived, the document will be labeled as "Pending"
If a recommender is not in your list contacts, simply click "Add Them" to add the writer to your list of saved contacts. 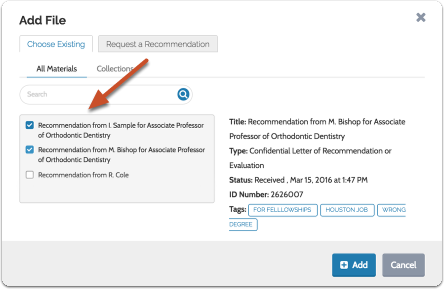 When making a letter request, select the letter writer from the dropdown list that appears when you click in the "Recommender" field. You can add as many letter writers as you want! 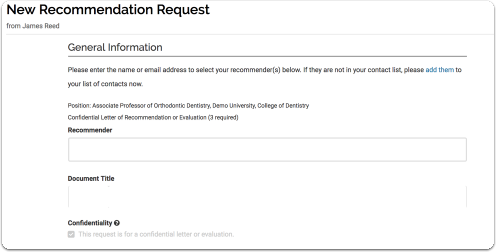 When you submit your request, we will create a document title for each letter you request, and replace the text variable "%RecommenderName%" with the name of your recommender. 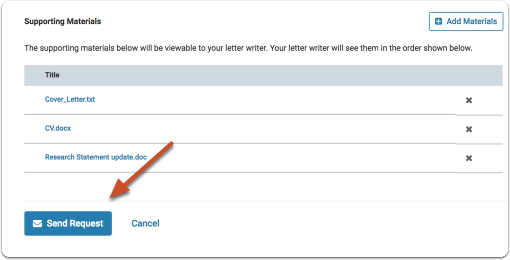 This allows you to personalize each letter request when requesting from multiple writers. The text you add will appear in the "Preview" field as shown below. Note that you can customize the document title, but you must keep the recommender name in the title. Provide a due date for when you need the recommendation. Specify if this is a general recommendation or a recommendation for a specific opportunity. Provide a a website address or text description of the opportunity for which you are applying. 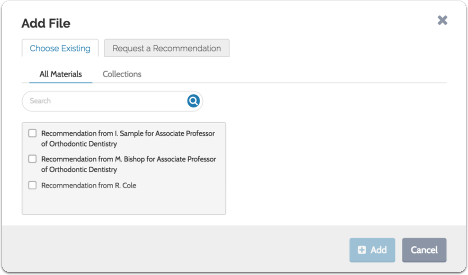 Note that we will personalize the message by inserting the name of each individual recommender in place of the text variable "%RecommenderName%"
You can click "Preview Request" to see how the message will look to recommenders. You can add materials from your Dossier that will be viewable by your letter writer. You can even include materials from collections. 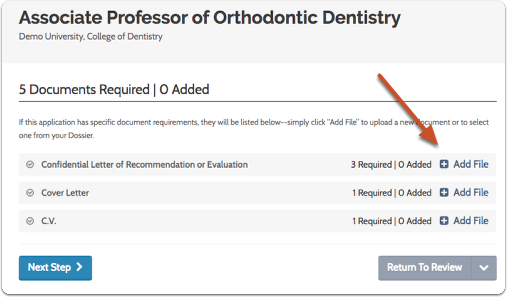 Simply click "Add materials" and select files you want to send along with your request. It's a good idea to check back over your request. Remember, you cannot edit a request after we email the request to your letter writer. Once you hit send, you should see a confirmation message showing your email was sent. Note that the "Confidential Letter" segment of the Document Requirements application section will be considered satisfied (indicated with a green check mark), and you can submit your application even before requested letters arrive.